Ian Markiewicz creates original works of art using some very unique methods every Thursday through Imagine!’s CORE/Labor Source (CLS) program. Ian’s work is getting noticed: the Longmont Times-Call recently did a feature story on him! 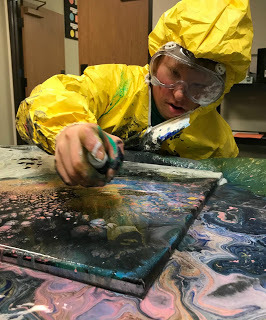 And if you’d like to see some of Ian’s work in person, along with a bunch of other CLS artists, they will have their artwork displayed on Saturday, May 19, during ArtWalk Longmont, a free arts festival in downtown Longmont. Join them if you can!